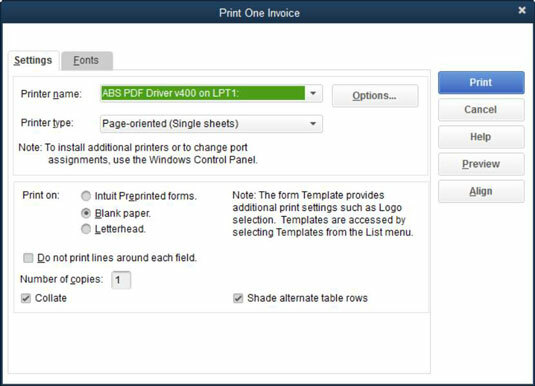 Click the Print button after you create the invoice or credit memo. After you fill in the boxes in the Create Invoices window or the Create Credit Memos/Refunds window, click the Print button. QuickBooks, ever the faithful servant, displays either the Print One Invoice dialog box or the Print One Credit Memo/Refund dialog box (which looks almost like the Print One Invoice dialog box). (Optional) Select the type of invoice or credit memo form. If you’re using a different type of invoice or credit memo form than you’ve described for the invoice printer setup, select the type of form that you want to print from the Print On option button choices. You can select Intuit Preprinted Forms, Blank Paper, or Letterhead. You shouldn’t have to worry about printing test invoice or credit memo forms or fiddling with form alignment problems if you addressed these issues when you set up the invoice printer. Click the Print button to send the form to the printer. QuickBooks prints the form. Review the invoice or credit memo and reprint the form, if necessary. Review the invoice or credit memo to see whether QuickBooks printed it correctly. If the form looks wrong, fix whatever caused the problem (perhaps you printed it on the wrong paper, for example) and reprint the form by clicking the Print button again.